This is my family's first experience with music lessons. How do I choose the right teacher? How can I help my child be successful? First, congratulations for asking the right questions! An involved and supportive parent is certainly a requirement for any child’s success at the piano. I’d like to share two articles from my friends Diane Hidy and Elissa Milne. There are the very best articles I’ve seen on these topics, and I think they are invaluable to any family considering piano lessons. 10 Things You Should Do BEFORE beginning Piano Lessons. What is your teaching style? What makes your studio unique? We know that every student learns differently, so we do not follow a one-size-fits-all approach to piano education. We take time to learn about your student, and use materials and resources to help them engage and learn in the very best ways. We believe piano lessons should be fun, creative, and engaging. We are immersed in the piano pedagogy community, and are active in our pursuit of new ideas, best resources, ways to engage and help students learn, and how to make piano practice productive. We want young piano students to have a strong grasp on technique, musicality, and music theory. Because we want to produce well-rounded musicians, we include instruction in aural theory (ear training), composing/arranging, and music technology applications as well. We also teach how to play pop music, church music, chord charts, and lead sheets. We believe students cannot be successful without practice support from teacher and parents. Not only do we provide detailed instructions on how to practice, we show the student and parent how to practice, and record audio and video so the student can listen/watch at home and refresh their memory on how to practice during the week. We also use a special app to make this connection between what happens in the lesson and what happens at home – it allows both student and teacher to record video and get feedback between weekly lessons. You can get a better idea of what a lesson looks like with videos on our Facebook page. Pianos are not required for KiddyKeys classes. All other students must have an instrument at home. Without one, they will be unable to progress through their lesson material, wasting your time and money. Think of it this way – would you send your child to baseball practice without a glove? Or to tap class without tap shoes? Then don’t try to do piano lessons without a piano! Digital pianos are also acceptable. The only requirements are 88 full-size keys and touch sensitivity (weighted action, graded hammers, and other terms) so that when your child pushes harder, it gets louder. It is important to not only learn to press the right keys at the right time but to learn the skills of sound production. Please be sure to have an appropriate keyboard stand and adjustable bench, as proper technique flows from proper posture. I do not recommend X-style stands as they can not only be unstable (and unsafe in houses with children 5 and under) but they prevent proper posture. Recommended Digital Pianos: Casio Privia, with furniture-style stand and Yahama P-115, with furniture-style stand. No, we offer lessons on a tuiton-based model. Lessons are charged by the school year. This ensures students receive lessons on a regular basis and have the greatest opportunity for success over a period of time. With beginning students, it is especially important to have consistent weekly lessons. We do offer an exception for adult students. Adult students may take weekly lessons charged by the month or pay-as-you-go at a premium rate. Lessons are usually charged by the school year. This ensures students receive lessons on a regular basis and have the greatest opportunity for success over a period of time. However, due to Mrs. Chesser’s impending maternity leave, tuition will be divided into semesters this year. Spring Semester – Tuition for this semester covers 18 weeks of lessons and at least 2 studio events beginning January 7thand ending May 30th.There are currently 20 weeks of lessons scheduled on the calendar, so there are two extra weeks (flex weeks) given for illness, emergencies, etc. There are no lessons scheduled the week of Spring Break. Please see the studio calendar for scheduled studio closings and holidays. Tuition and registration not only pays for the weekly lesson time, but also includes preparation time, curriculum planning, instrument maintenance, studio libraries, studio licensed materials, printed materials and supplements, teacher continuing education, and professional organization memberships. KiddyKeys Group Classes are $50 per month, with a $15 registration fee that includes class materials. Adult students may pay by the month. We also offer a premium service that allows adult students to schedule lessons with 48 hour notice, and those lessons are charged individually. We understand taking on private music lessons can be a financial burden on some families and we never want to turn someone away! For this reason, we offer a select number of spots at a reduced tuition rate in partnership with MusicLink Foundation. MusicLink Foundation reaches out to low income families by linking these students with professional music teachers willing to reduce their fee to make the lessons more affordable for the child. You may fill out an application here to see if your family qualifies for a reduced tuition. 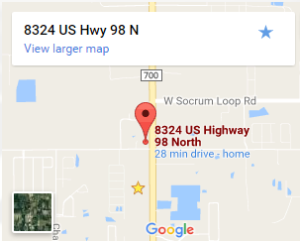 Our home piano studio is in North Lakeland. For privacy reasons, I do not list my home address, but the map to the right shows a gas station near the studio. Piano lessons in Lakeland, Fl 33810. Lessons are available Monday through Thursday, from 10am-7pm. Adult students may take lessons with Ryan Chesser on Saturday mornings. Please contact us for more information about which days and times are currently available. We specialize in teaching piano to beginners! KiddyKeys group classes are available for children ages 3-6. One-on-one private lessons are available for preschoolers and school-age children. Adult students are taught by Ryan Chesser. If you are an adult student, please contact us to discuss how we can help you reach your goals at the piano. How much practice is required/expected? Even if you have no desire to become a concert pianist, students (and parents) need to understand that it takes hard work and discipline to become a good musician. Practice at home during the week is critical for the development of proficiency at the piano and cannot be overemphasized. A student who does not put in adequate practice time is likely to become frustrated and enjoy the piano less and less. A student who practices frequently will be spurred on by the success they have, and will be inspired to continue their journey as a pianist. Students are expected to practice daily. Practice does not necessarily mean sitting at the piano for the required time and reviewing assigned pieces, but also includes theory assignments, using musical applications recommended by the teacher, listening exercises, composition, and more. For younger students, breaking practice into small, obtainable goals that can be accomplished in 15 minutes or less is best. I will provide you with all the tools and resources to teach your child how to practice as well as teach you how to help your child with piano practice. All you have to is be present for practice – I will teach you the rest. This is especially true with young students and pre-readers. The parent will need to read practice instructions, guide the student along, play games and activities for some fun reinforcement, and give appropriate praise and feedback. Yes, there are multiple performance opportunities held each year. A formal recital is held in May. Do you have a background check? I have passed a background check, as required as an active teacher with MusicLink Foundation. Please read the Sexual Abuse and Prevention Policy provided by MusicLink here . In addition, you are always welcome to sit in on lessons or wait in the living room. Get Your FREE Preview Lesson!